The GDG Korea Campus evolved from GDG SSU. GDG SSU started in 2012 by students for students of Soongsil University. KyeongWan Kang and Kaeun Lee were both GDG SSU organizers and felt that being part of the community helped them grow as engineers. They wanted to offer this opportunity to other university students in South Korea, leading to the creation of GDG Korea Campus in 2016. The community now includes 500 members with an average of 60 meetup participants. Students are the biggest group, but the community also includes business developers and designers who sometimes become mentors. What is your personal motivation for community involvement? 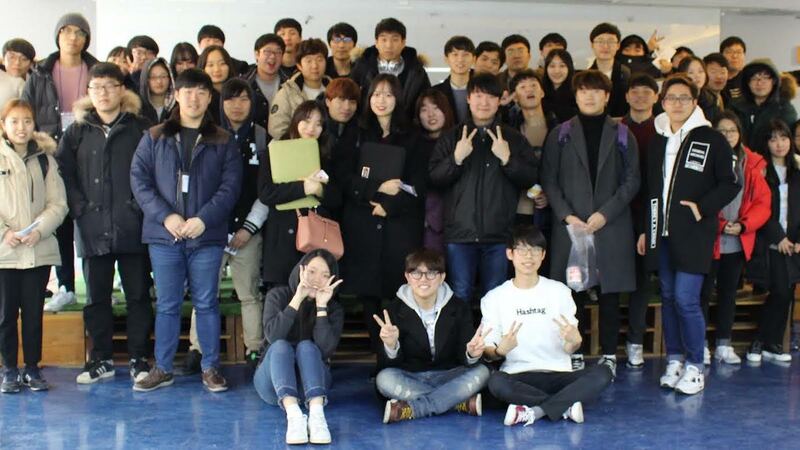 KyeongWan: I wanted to be a part of a developer community since high school. That’s why I joined GDG SSU and after 2 years became an organizer. Kaeun: I saw that being part of GDG SSU made a lot of sense in combination with my field of study and I joined right after I started university. I wanted to include more students in the GDG activities, so creating a larger organization seemed like a good idea. That’s how I became an organizer of GDG Korea Campus. What do you think are the main benefits for members of a community like GDG? KyeongWan: We are both usually wondering what other people are creating, what sources do they use to learn, etc. Also, we see meetups as an opportunity to meet students from other programs. It gives us a chance to share their knowledge, and as a result, the whole group benefits and grows. You can easily access a wide variety of topics that you might not have know about. What do you think you are best at as organizers? KyeongWan: I think I'm generally good at getting things done. Kaeun: I'm a good DJ :) I'm in charge of music for our meetups. KyeongWan: Making this community a real thing, and that not only students but also professionals are a part of it. Also that we were able to figure out a way to communicate effectively as organizers. We use Slack for that and there are app 50 people chatting regularly. We’re really proud that we had 400 attendees for our Devcamp in 2016 and about 170 developers and designers at the Dev Challenge 2017. What were some of the biggest learning moments for you (maybe challenges you had to overcome)? KyeongWan: I'm learning from everything we do because it's still kind of a start-up period in our chapter. What kind of challenges do you currently face as a community? Kaeun: We noticed that study groups that do not involve organizers tend to be less active over time. We suspect that it is due to the fact that sometimes it’s difficult to break away from the classical model of students listening to a lecture rather them learning from each other. To some extent, it is natural. If you are used to the classical way of learning, you might think there is no other way. But we still hope to change that to be more interactive. It is also challenging to determine the theme or level of a meetup, because the interests and skills of people attending are so diverse. KyeongWan: I hope that more and more GDG Korea campus members will attend and benefit from events organized by Google and targeted at students, such as Google Admob, GSOC, and CodeJam. I hope that more students will join our community and grow together as IT professionals.